In a world of blogposts and ezines, sports highlights and doping charges, it may be possible that some of you may fancy the literary version of the casual Copenhagen bike culture. Firstly, there is a wonderful novel by none other than H.G. Wells called The Wheels of Chance. First published in 1897, the humourous novel portrays the freedom that the recently invented bicycle gave to the working classes and to women and how it heralded an era of social change. There is a decent Wikipeida entry about the book. 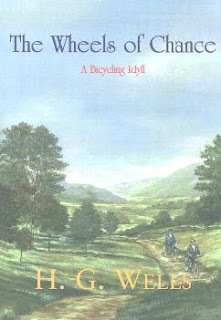 Download The Wheels of Chance by H.G. Wells free on Project Gutenberg. There there is the fine book Three Men on the Bummel, by Jerome K. Jerome, published in 1900. Jerome is better known for that classic of humourous literature Three Men in a Boat (To Say Nothing of the Dog). Three Men on the Bummel is a sequel to that novel, wherein the three characters go for a cycling holiday in the Black Forest of Germany. "A 'Bummel'," I explained, "I should describe as a journey, long or short, without an end; the only thing regulating it being the necessity of getting back within a given time to the point from which one started. Sometimes it is through busy streets, and sometimes through the fields and lanes; sometimes we can be spared for a few hours, and sometimes for a few days. But long or short, but here or there, our thoughts are ever on the running of the sand. We nod and smile to many as we pass; with some we stop and talk awhile; and with a few we walk a little way. We have been much interested, and often a little tired. But on the whole we have had a pleasant time, and are sorry when it's over." Download Three Men on the Bummel by Jerome K. Jerome free on Project Gutenberg.